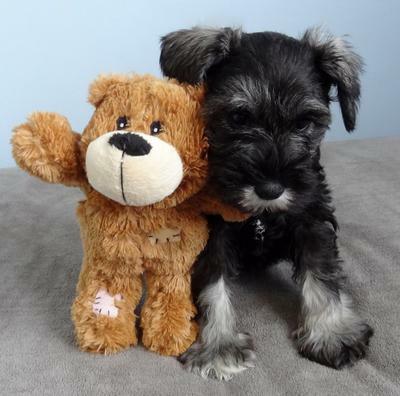 Micka arrived on at 8 weeks of age, a Miniature Schnauzer breed, black and pepper in colour, she is one hell of a healthy puppy, energetic and eats the right food, she's on the Royal Canin Medium breed for puppy until 12 month of age, getting one cup a day. She enjoys playing with my other Schnauzer who she plays with every day. They seem to have bonded very well. Micka likes to play with the ball, she has enough toys to keep her occupied during the days. With enough interaction with the familly. A Very happy puppy let me tell ya.